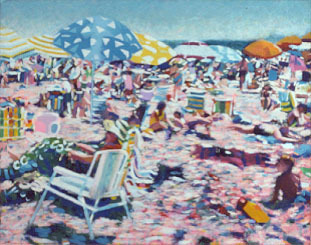 This is an original oil on canvas painting called Mosaic Beach. My first impulse to do a beach painting came when I was on the beach, without my glasses. Since I'm farsighted, I could basically only see a million small areas of bright color, and I thought, 'Wow - what a painting!' I've done a number of different versions, but this one probably comes closest to my original vision. I called it Mosaic Beach because of this characteristic of many small dabs of color, many about the same size. I also worked with semi-transparent layers of color, which causes a certain richness and depth of color. Beaches are all about the bleaching quality of the sun, so there is also this hazy, brilliant quality to the light. I like the range of people shown, particularly the older woman with her blanket, and the little boy with his yellow truck. This painting is professionally framed in a plain, rounded natural wood.